Nevertheless, as an optimist by nature, I held out hope that a hidden gem could still be unearthed in the Free State. 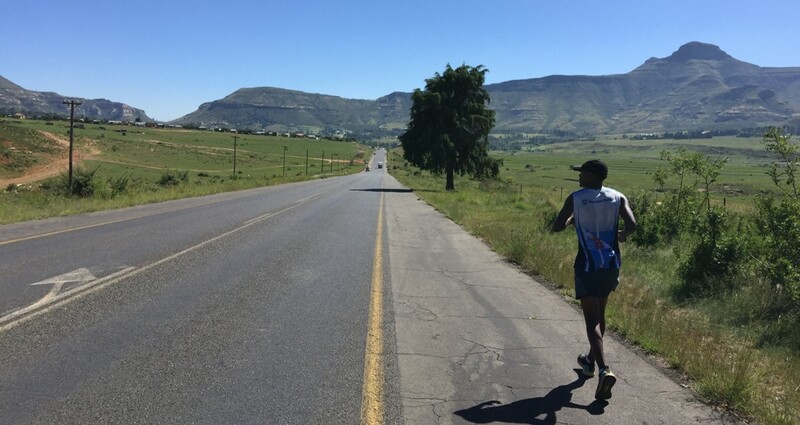 Many marathons ago, I got chatting to some runners from Bethlehem (if memory serves me correctly it was one wise man and two wise women) who told me of a neighbouring town called Clarens and a marathon called Surrender Hill. This year, the stars aligned and I successfully navigated the 300km journey south of Johannesburg to Clarens – a small town full of charm, quaint shops, art galleries and al fresco restaurants. 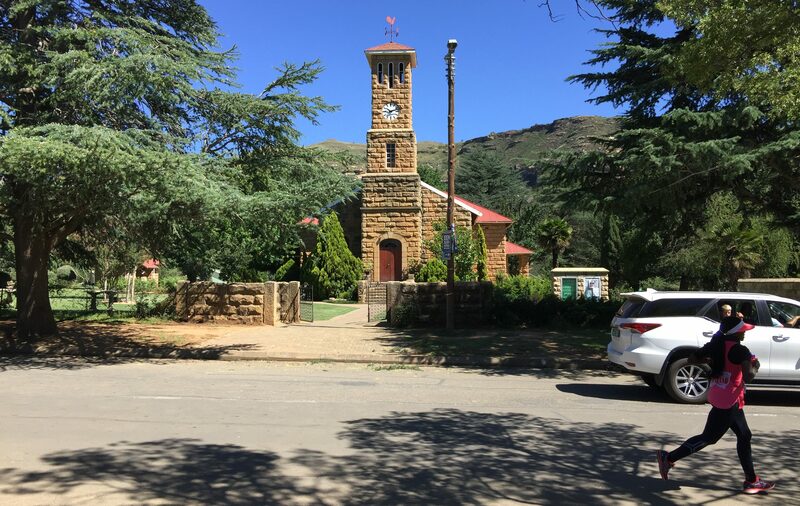 Most of the town is constructed from sandstone quarried from the magnificent Maluti Mountains and has earned the nickname, ‘The Jewel of the Eastern Free State’ – very appropriate considering I was hunting hidden gems! Most of the buildings in town including the church are constructed from sandstone quarried from the nearby Maluti Mountains. 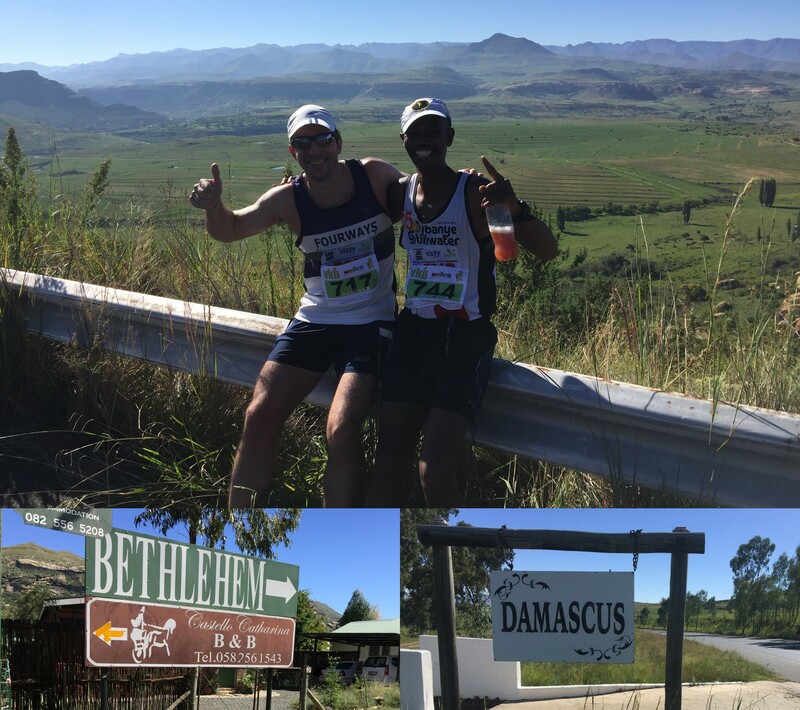 Whilst it might be customary to arrive in Bethlehem bearing gold, frankincense and myrrh, the more practical people of Clarens just asked for R180 ($12/€11) – and in exchange I received my race number, as many energy bars as I could eat in one standing and a 2019 VKB Diary. VKB Landbou is an enterprise that specialises in supplying production inputs and value-added services to the agricultural industry. They are a cornerstone of the economies in the rural Eastern Free State and Limpopo, employing almost 6,000 people and investing heavily in initiatives that benefit the communities and areas in which they operate. 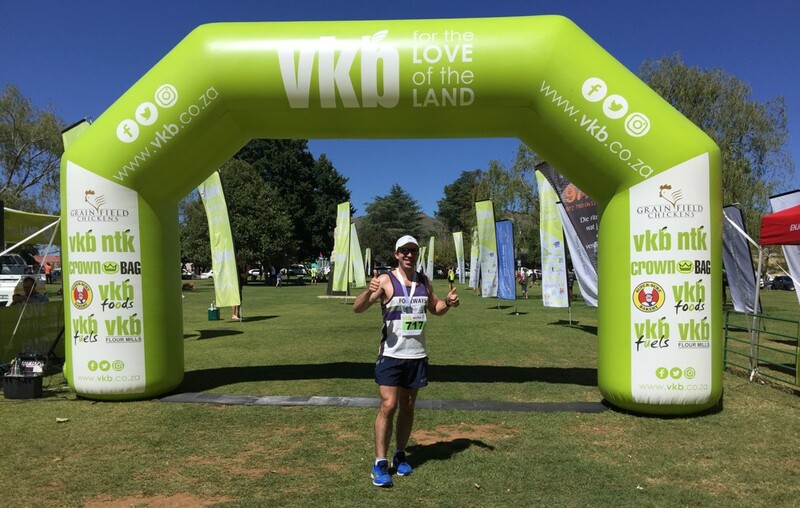 VKB celebrate their centenary in 2019 and live by their motto, “for the love for the land”, sponsoring both the Surrender Hill and Bielie Mielie Marathons ensuring that runners from all over South Africa can enjoy the beauty of the Eastern Free State. As for whether sponsoring a race helps with brand recognition? The massive grain silos along the N3 near Villiers are unmissable. I’ve driven passed them many times but the first time I noticed that they were VKB silos was on the drive back home after the Surrender Hill Marathon. Photo of the Villiers Silos from VKB website. In Clarens, everything is within ‘walking distance’ – it is a place where you park your car, forget about life for the weekend and try to remember where you put your car keys before returning home again. 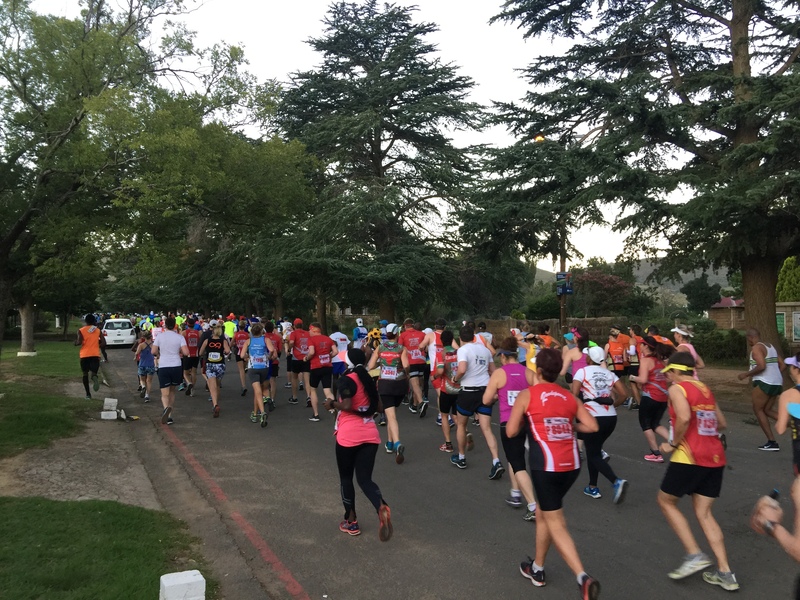 It’s a town where everything centres around the town square (oxymoronic phrasing intended) – this includes marathon running and just before 6am I took the 200m stroll from the door of my B&B to join several hundred runners congregating in the town square. The start was festive with most of the field selecting the (much easier) half marathon and 10km options (just 182 ran the full marathon). The reputation of the race is such that it attracts a fair number of runners from other provinces and we got to enjoy a few tunes from the local radio station who had set up shop in the square. 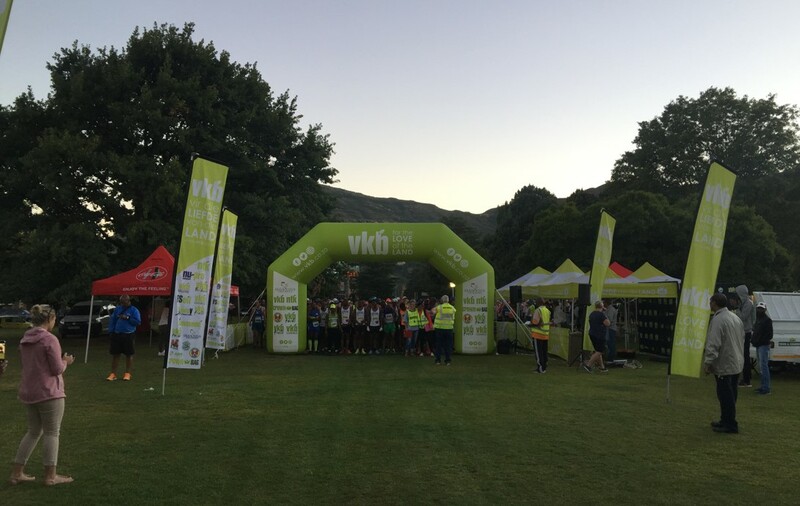 Several hundred runners get ready to start just after dawn in the Clarens town square. The full and half set off together on out-and-back routes with ‘Chariots of Fire’ the precursor to our battle charge. 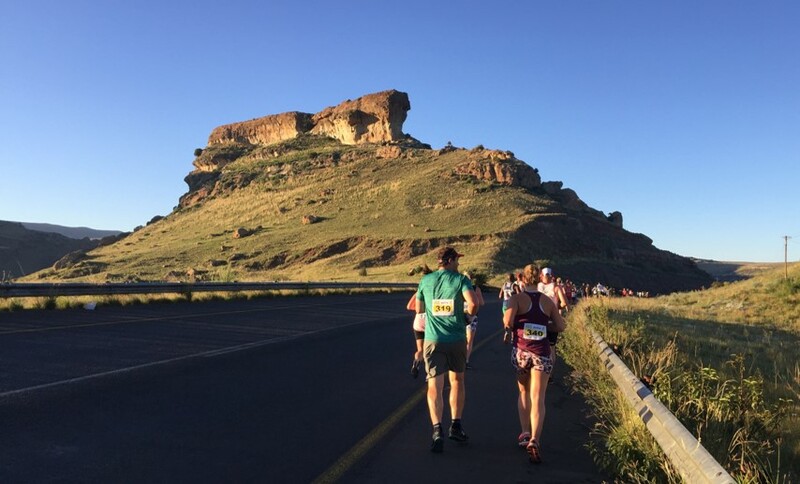 However, I thought it would be more appropriate to start the marathon runners with Cheap Trick’s ‘Surrender’ and the half marathoners with Springsteen’s ‘No Surrender’ (as these cowards merely take a few steps up Surrender Hill before they cower, turn around and flee back to Clarens). With start line fever in your blood you don’t notice the short climb out of town and, before anyone can complain about the hills, you drop from an altitude of 1,830m to 1,690m over 7km – leaving the naïve and ill-informed to think, “so much for this being a tough marathon!” Much of the descent occurs over the first 2km but my legs didn’t notice with all the early morning chit chat. The out-and-back route is surrounded by mountain ranges (the solid line is the Lesotho border). 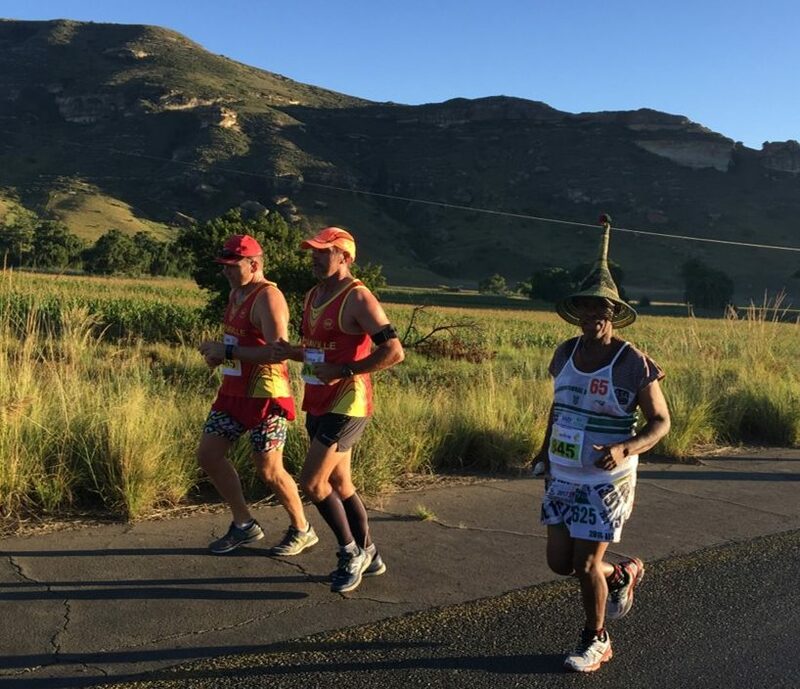 Clarens is a few kilometres from the Lesotho border and I spotted local runner, Andrew Mosotho, running in a traditional Basotho outfit which included his Mokorotlo hat. The hat, which features on the Lesotho national flag, is also known as ‘modianyewe’ (meaning “he who executes judgement in court”) and is used symbolically to cast rulings in customary courts (much like a gavel in western courts). Andrew Mosotho sporting his traditional Mokorotlo hat (whilst in the background Coenie Venter shows of his ‘funky pant’ as traditionally worn in Bothaville). As we hit the foot of Surrender Hill, the faster half marathon runners were already making a hasty retreat – and one could see a look of relief in their eyes having escaped the clutches of Surrender Hill. However, us hardier marathon runners got no such respite and soldiered onwards and upwards, passing through the 21km turnaround point with a steely glaze in our eyes and a nervous twitch in our legs. One should always be wary of marathons with the word ‘hill’ in the title – and Surrender Hill indisputably enhances this reputation. The big climb on the out-leg is a steady 6.5km pull taking you from a low of 1,690m to a high that scrapes 1,900m. Surrender Hill earned her name in 1900 when the Free State Boers surrendered to the British during the Anglo Boer War (and is now a national heritage site). Before then, this exquisite monstrosity was known by the far gentler name of ‘Sleeping Beauty’ – and over my protracted ascent up her slopes I reflected that the ‘let sleeping dogs lie’ matra could well apply to hills as well. Surrender Hill earned her name in 1900 when the Free State Boers surrendered to the British during the Anglo Boer War. It was good thinking on the organisers’ part to only give the marshals red flags. Had they been issued with white flags, I expect a few of us would have grabbed them and re-enacted the surrender! 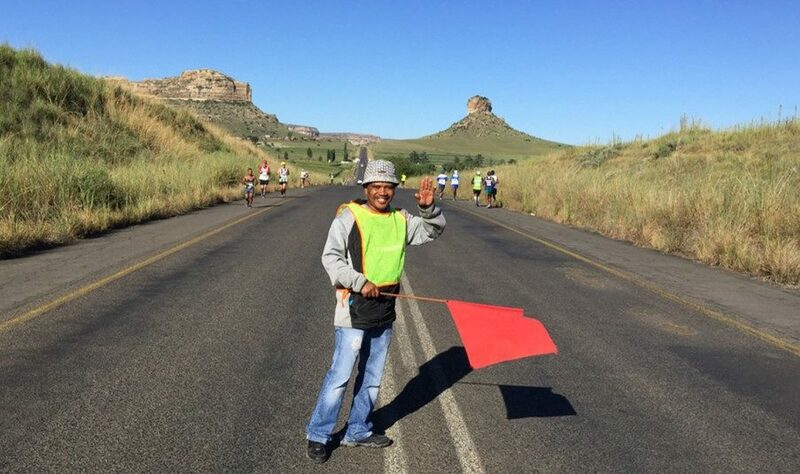 A friendly marshal waves his red flag at the runners. The views from the top are fantastic – a crystal clear 360° panorama of rolling green hills, sandstone cliff faces and distant mountain peaks for as far as the eye can see. Running close to the sun at the top of Surrender Hill. However, the battle is not quite over and there is still some work to do before you can say you’ve conquered Surrender Hill. This is a hill with two peaks and a 1km downhill recovery is followed by an 800m climb to the second crest. I met Moses somewhere on the road between Bethlehem and Damascus during the marathon (and we took a minute to enjoy the view). Unfortunately Moses only parts liquid (and not rock) so we had to run over (not through) the Maluti Mountains. I recently read about American long-distance runners who are using marijuana to get them through their long runs: whilst deprived of oxygen and enjoying my runner’s high on top of Surrender Hill, I remember thinking that running a marathon in the Maluti Mountains is a much better way to get stoned. The best way to get stoned and enjoy your runner’s high. Meyerton is a small town in the Midvaal just north of Vereeniging whose parkrunners are trying to get the whole country stoned. 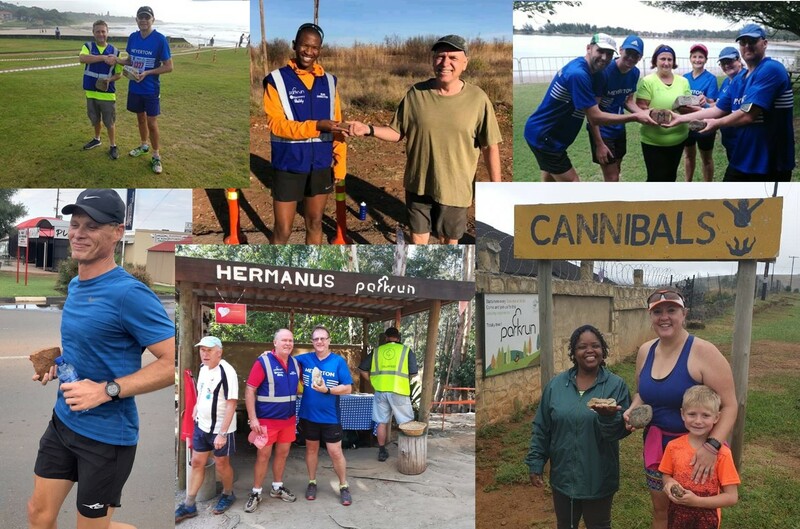 Like many of their kin they practice parkrun tourism, travelling South Africa to visit as many of the 200-odd parkruns as they can. However, unlike other parkrun tourists, they arrive bearing a gift in the form of an authentic piece of Meyerton rock. Two pieces of highly prized Meyerton rock. 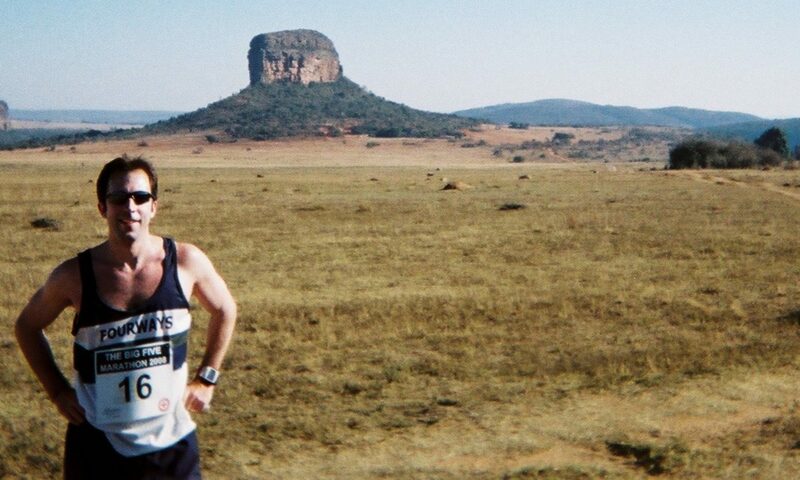 The Meyerton parkrunner hunts down and accosts the (usually very surprised) local Event Director, ‘stoning them’ via an official handover of the Meyerton rock in exchange for a local equivalent. The Meyerton parkrunner then returns home to add the new piece of stone to the trophy cabinet. 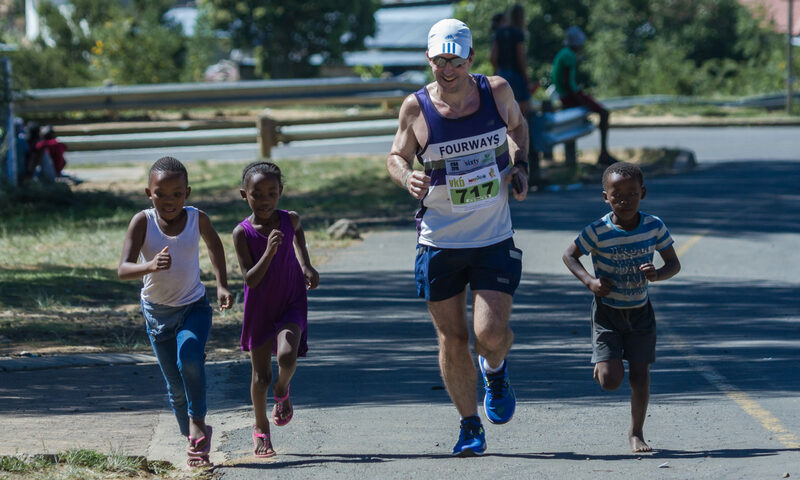 So far Meyerton has stoned about 20% of South Africa’s parkruns – and those runners who successfully colonise an additional parkrun earn themselves the title “Rockstar”! A collage of Meyerton parkrun stonings (With thanks to Meyerton parkrun ED Roland du Plessis for the information and photos). After tramping Surrender Hill into submission, there are five lovely downhill kilometres to the turnaround point with spectacular sandstone cliffs and natural wind-carved sculptures dominating the landscape. It was at some point on the downhill that I met up with two of the Hopane brothers, Jackson and Hops. There are in fact seven brothers but they told me that they are the only two of the lineage strong enough to run marathons without getting injured. The strongest of the seven Hopane brothers. 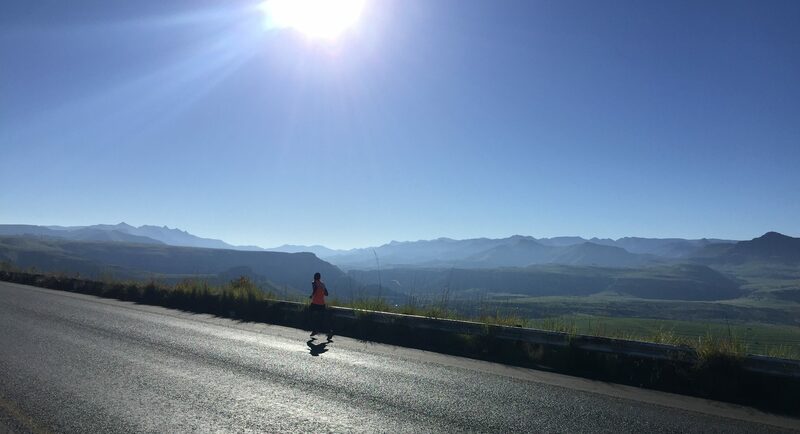 Despite all the climbing one almost loathes reaching the turnaround point, such is natural beauty of the Maluti – not often that happens in a marathon! Of course, this reluctance to turn around might also have been caused by knowing one needs to go back up and over Surrender Hill again. Taking my time at the turnaround point – in no rush to go back up and over Surrender Hill. My mind told me that it was just a case of getting back to the top of Surrender Hill (at around the 29km mark) and then it would be downhill all the way home. However, I didn’t realise just how much we had descended in the first 7km – and now it was payback time. At least I still had Hops to keep me company and we tried to forget about the climbing with some stimulating conversation. Looking at the route profile afterwards I noticed that the graphic resembled a crab-claw knuckleduster. For those that haven’t thrown in the towel after 40km of constant jabbing and several sturdy body blows, the final knock-out punch is delivered over the last 2km. This last hill kills all conversation and probably adds five to ten minutes to most people’s finish times. Having run the full length of Surrender Hill (both ways), I was determined not to let this brutal final climb reduce me to a walk – and was fortunate enough to get some pacing assistance. Some photos don’t need a caption, just a credit. Thank you Andre Harmse for this awesome picture of the pacing assistance I received over the final climb at the Surrender Hill Marathon. After 208 marathons, the above photo is by some way my favourite. Apparently, the kids had been helping a few runners up the hill earlier in the day and were nicely refreshed after a lengthy break. I call the expression on my face a ‘smimace’ (that’s when you smile and grimace at the same time) – and their youthful enthusiasm kept my legs going all the way to the finish line back in the town square. 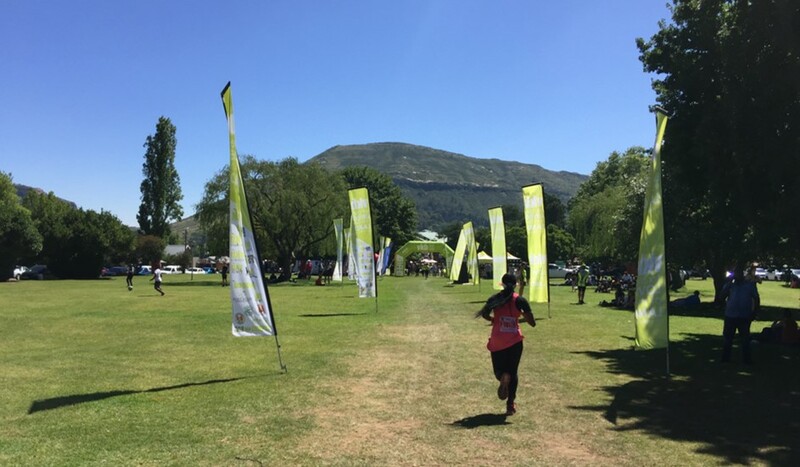 Finishing back at the Clarens town square. Marathon running is thirsty work and, having run a lot of the race with Hops, I looked to add some barley and yeast to post-marathon recovery mix. The good news is that every side of the Clarens town square is lined with establishments specialising in the satiation of one’s thirst – and a beverage from the local craft brewery did the job effectively. Signing out from the Surrender Hill Marathon. 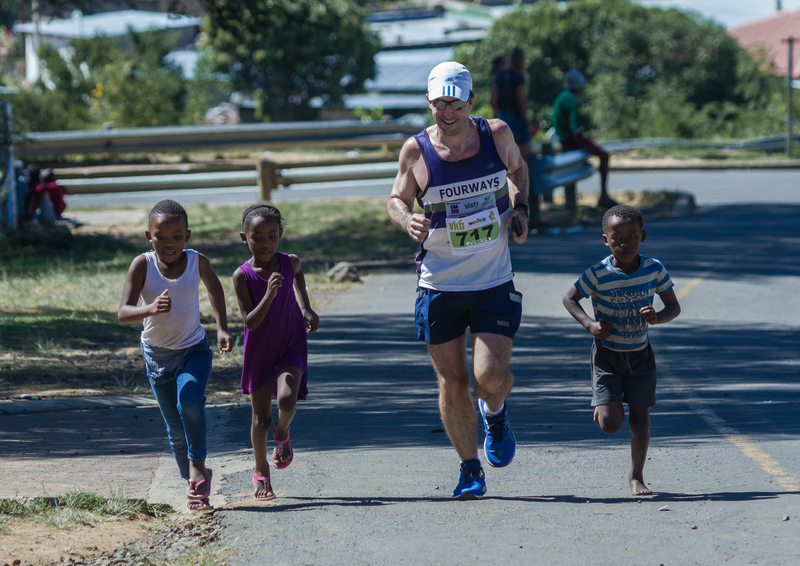 Look out for the next race report from the John Nugent Marathon in Upington. Don’t often see a pic of you taking strain, but it does look like a well organised and scenic run. Well done Stuart. 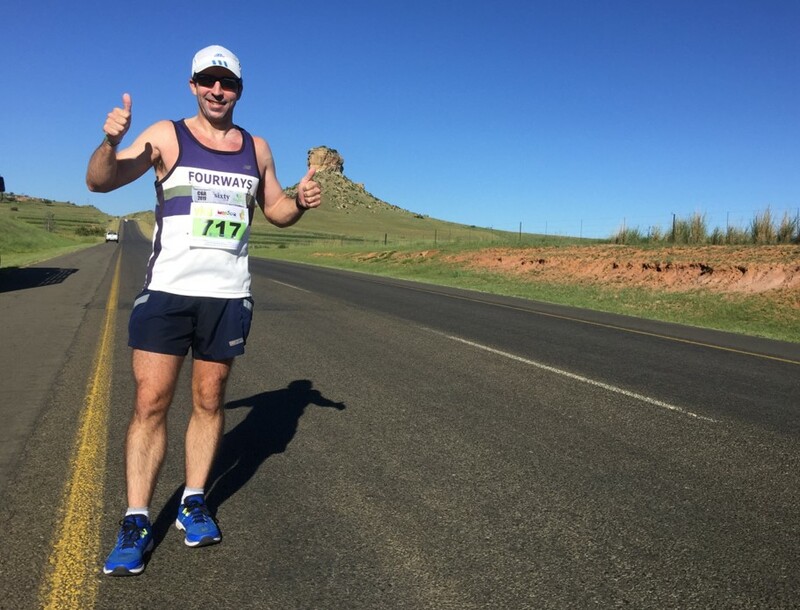 Indeed a tough marathon…… Back in the early years, it used to be like Comrades, one year you start in Clarens and finished in Fouriesburg, and the other year you start in Fouriesburg and finished in Clarens. For me personal i think the old Clarens Fouriesburg route was tougher than the out and back as is is now…. 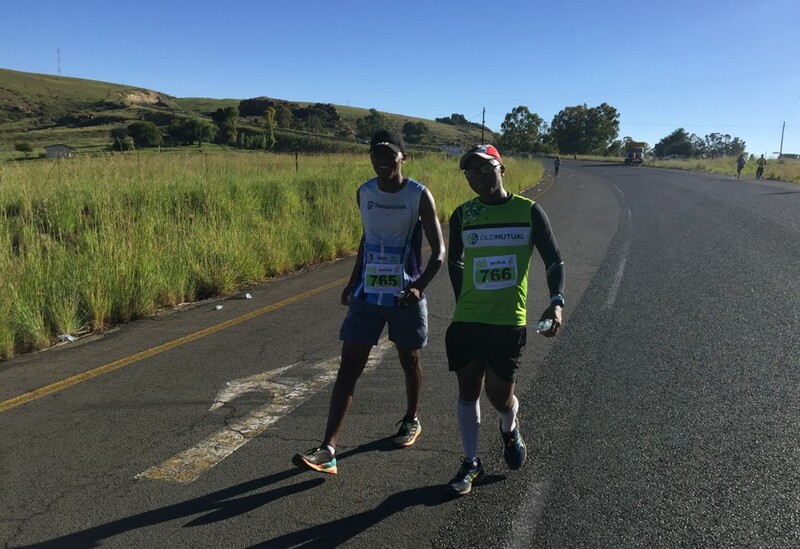 Logistics is much better with the out and back, still very good practice for Comrades…….